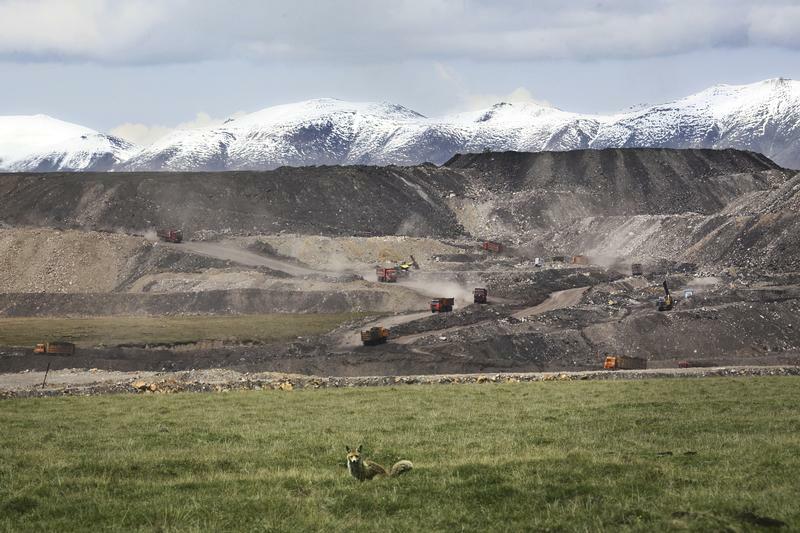 An investigation by Greenpeace China has revealed opencast coal mining is taking place on a remote alpine plateau in the foothills of China’s Quilian mountains. As Beijing moves to ban the use or sale of coal to limit air pollution this week, and the whole industry is shifting to the northwest of the country, these mines represent the frontier of China’s coal domain. Here, private firms operate in violation of conservation laws, risking a deterioration of the water levels available in three of China’s major rivers. This is no ordinary plateau – the water-logged ground trickles with meltwater and rainwater streams (see below), feeding the Datong River, one of the sources of China’s ‘mother river’, the Yellow River. But it is here, at its source over 4,000 metres above sea level, that coal mining is threatening the water supply to the Datong River, with possible knock on effects for the over 50 cities and 420 towns that rely on the Yellow River – China’s second longest – for their drinking water and thousands who use it to irrigate their fields. On the massive ‘Muli’ coalfield (pictured above) private companies excavate the land for coal and dump the overturned earth and rocks near the Datong River. The undercover investigations also found topsoil being heaped into the watercourse of the Datong River near roads and railways built to service the mine. These obstructions (see above) could prevent glacial meltwater from the mountains from feeding into the Datong River, increasing the risk of water scarcity at times of low rainfall. The Muli coalfield consists of four opencast mines on the plateau – two are operational and two are on the verge of opening. By 2013 the expansion of the Jiancang and Juhugeng mines resulted in the loss of 42.6 kilometres squared of pristine meadows – and their capacity for holding water – according to calculations based on satellite data. The two mines (Jiangcang and Juhugeng, satellite images below) have been extracting on a large scale since 2003. The problem – from an environmental viewpoint – is that around 3.54 billion tons of coal lie under the plateau – almost 90% of Qinghai province’s coal reserves. There are plans to expand the Muli mines to an area of around 112.6 kilometres squared with the Duosuogongma and the Hushan opencast coal mines ready to go, but not yet operational (see locations below). But expansion appears to be taking place in violation of environmental rules. The Jiancang and Juhugeng mines exist in the Quilian Mountains National Ecological Functional Zone for Glacier and Water conservation, and the two new ones have their facilities set up in the Qinghai Quilian Mountains Nature Reserve for the Sources of Three Rivers (Datong, Shule and Buha rivers), which is meant to be an even stricter conservation area. That means the sites have been operating in violation of national laws and provincial regulations protecting nature reserves, water source conservation, and wetland and grassland protection – according to a legal analysis based on evidence gathered on seven separate field trips to the remote region during 2012 to 2014, together with satellite images. However, despite a 2010 environmental impact assessment highlighting the issue of mining in this protected area, and 2011 guidance from China’s Ministry of Environmental Protection suggesting that local authorities ban activities preparing for mining at sites on the nature reserve, coal mining activities and development continue to go ahead. The mining is being undertaken by a handful of private firms led by the China Kingho Energy Group, which is mining at the largest scale on the plateau. They are joined by Qinghai Yihai Energy Co, Quinghai Coking Coal Group, Aokai Group, and China Railway Group. Kingho Group transports the coal it mines (one of its mines pictured above) at the Juhugeng coal mine to its coking facility called “Kingho Coalification Industrial Park for Circular Economy”, 145km away. At 3,700m, it’s the highest coking plant in the world. The firm appears to have constructed a building in the style of the Forbidden City palace on site at the plant (below). The investigation reveals the shift in China’s water intensive coal industry from the relatively industrialised east to less developed, and often environmentally more sensitive regions. As coal control measures as a result of choking smog in eastern provinces take hold, China’s coal industry – from mining to coking and power generation – has simply been moving to the north and west. Large swathes of China that are affected by the change suffer from water shortages or rely on the Yellow River. China is building new 16 mega coal power bases (fed with the black stuff from 14 mines), mainly in these areas as part of a five-year plan started in 2012. These could further exacerbate water scarcity in these arid regions as they will consume nearly 10 billion cubic meters of water, the equivalent of one sixth of the Yellow River’s water volume. Of these, five coal industry hubs will be in the Yellow River basin (see map below). The coal industry’s demand for water will outstrip supply by 2015 in four arid provinces that rely heavily on water from the Yellow River, according to a 2012 study by Greenpeace China. Adding to the potential crisis, is the coal-to-gas industry, which is also highly water intensive. There are currently two pilot plants that are operational, with 48 more in the pipeline. These 50 plants could produce 225 billion cubic metres of synthetic natural gas [SNG] per year within the next ten years – and around 80% of this output is located in areas of ‘high’ or ‘extremely high’ water risk. Earlier this year a state-owned coal company and the world’s biggest coal producer by volume, the Shenhua Group, said it would stop exploiting groundwater for their coal-to-liquid project in Inner Mongolia following an investigation revealing the impact of their operation on an area already struggling with severe water shortages.